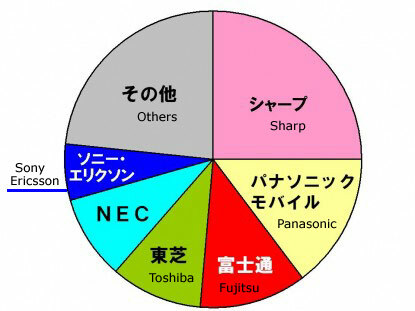 Sharp sold the most mobile handsets in Japan during fiscal 2007, with 25% market share, to hold top spot for the 3rd consecutive year according to data released by MM Research Institute. The company boosted handset shipments by an impressive 23% YoY, for a total of 12.76 million units, setting a new record as their Aquos branded LCD models proved to be a popular choice with growing consumer demand to watch 1Seg digital tv broadcasts. Overall, the domestic handset sales increased 2.9% to a new record of 50.76 million units. Panasonic Mobile retained 2nd position with 14.5% while Fujitsu jumped from fifth to 3rd reporting an improved 11.7% market share. Toshiba and NEC. at 4th / 5th respectively each dropped down one position while Sony Ericsson held steady for the 6th slot. The top three manufacturers both sold more handsets and increased their positions, while the No. 4 to No. 6 ranked firms saw their shipments fall.